One of the best ever ways to pass time is to see movies. Good movies can touch your heart and soul. It is true that romantic movies can make you feel youthful again. Thrillers can keep you on the edge of your seats. Similarly, the martial arts movies have their own place in the hierarchy. They have a set of favorite audiences who like to see every martial art movie. One must concede that the martial art movies can be extremely great to watch for the simple reason that you can find some of the best body movements in these films. There have been legends in this martial field. Bruce Lee must be unarguably the greatest martial arts actor of all time. Jackie Chan should rank a close second because of his fantastic ability to mix martial arts with a great sense of comedy. Therefore, you can find a couple of films of these favourite martial arts movies in every Top 10 list of martial art movies of all time. Let us look at our top 10. We have prepared this list after considering several factors, the most important of which is popularity. These ten movies can run to packed audiences even if the producers release them today. One of the best movies made in Hong Kong, Come Drink With Me is at No 10 in this list. 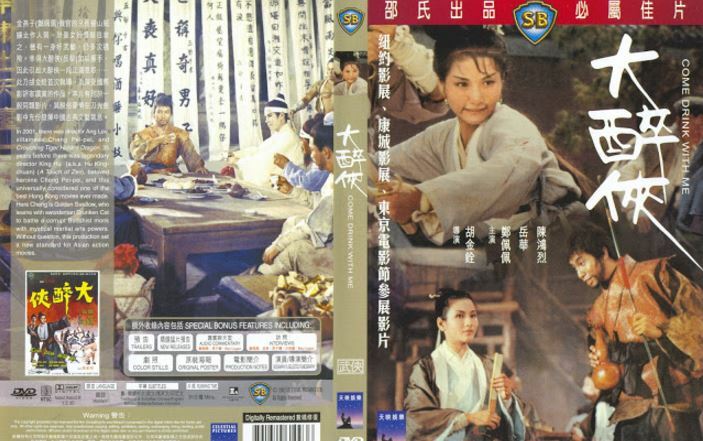 Set during the Ming Dynasty, this film stars Cheng Pei-Pei and Yueh Hua in the lead roles. Chan Hung Lit performs the role of the villain to perfection. A bandit gang kidnaps a general’s son and holds him hostage to secure the release of their leader. The general’s daughter, a martial arts expert sets out to save her brother. She wages a classic fight with then with the help of a drunken beggar. The drunken beggar is a martial arts master himself. In the end, all ends well with the good prevailing over the evil. At No. 9 we have one of the greatest martial arts films even to set the screens on fire. Seven Samurai directed by Akira Kurosawa, is a Japanese epic drama. A group of bandits terrorize the villagers into parting with their harvest. One villager decides to take up the fight to them He hires a master-less samurai to help the village. The Samurai ropes in his friends and the seven of them train the villagers into combating the menace of the bandits. Highly acclaimed by critics all over the world, this film has been remade in almost every language in the world. The 1992 film, The Swordsman II comes in at No. 8 on this list. This Hong Kong film is again centered on the Ming dynasty and the members of the Mount Hua Sect. The antagonist DongFang Bubai is a transgender, plotting with some Japanese Samurai warriors to overthrow the Ming Dynasty. Linghu Chong and Yue Lingshan come to k now of this plot and hence set out to save the Ming dynasty. What follows is an excellent display of swordsmanship that can put the first part of the series into oblivion. Made in 1982 in Hong Kong, this martial arts fantasy movie is at No. 7 on this list. Set in the backdrop of the Qing dynasty, the Queen sends her agents in search of the supernatural martial artists who can stave off bullets as well. One of these agents disbands the forces. This makes the queen order the others to find him and eliminate him. The film has some classical fight scenes involving the legendary weapons of China such as rope dart, snake halberd, double-edged sword, etc. There are scenes involving some great hand to hand combat as well. This revenge story of a pupil avenging his teacher’s murder comes in at No 6 on this list. The name of the film is actually Fists of Fury. It was accidentally released by the name of The Chinese Connection in the US to tap into the popularity of another film, The French Connection released in 1971. It was decided that they would use this title for the release of another Bruce Lee’s film, The Big Boss. However, due to a mix up, the titles got switched with Fists of Fury releasing as The Chinese Connection and The Big Boss releasing as Fists of Fury. This comedy apart, there is no element of comedy in this out-and-out martial arts film that has Bruce Lee portraying an excellent role of the avenger. At No. 5 we have Jackie Chan making an entry into Hollywood with his film, The Police Story. The first part of a series of films by the same name, this is one of Jackie Chan’s best action movies. People consider Jackie Chan as Bruce Lee’s successor to the throne of the ‘King of Martial Arts’. Jackie does not disappoint anyone with his tremendous pyrotechnics. A huge success in the Eastern part of the world, this film was the launching pad for Jackie Chan into the Hollywood film industry. Starring Bruce Lee, John Saxon, and Jim Kelly, this is an iconic martial arts movie set in the backdrop of the crime and lust in Hong Kong. The film, Enter the Dragon, does not need any introduction at all. The last film of Bruce Lee, Enter the Dragon, is a blockbuster hit all over the world. Approached by the British Intelligence agency to penetrate the fortress of Lord Han, a noted criminal, Bruce Lee enters a fighting championship on Han’s island. He also learns that his sister’s killer is also on the same island. Bruce Lee wins the championship by finishing off Han’s gang before subduing Han as well. The fight scene in the hall of mirrors is an excellent concept, finding its way into many films in other foreign languages. One of the top martial arts films, The Drunken Master II starring the redoubtable Jackie Chan, is at No. 3 on this list. Released in North America by the name The Legend of the Drunken Master in 2000, this film brings out a new facet of Jackie Chan to the fore. Jackie’s excellent sense of comic timing is the highlight of the film. The way he fights after appearing drunk is stupendous. This film has several scenes where Jackie Chan is beaten mercilessly because of his consumption of alcohol. His master implores him to let go of the habit. In one of the fights, they shoot his master thereby enraging Jackie Chan to vow to finish them off. Set in the backdrop of the British Consulate crimes, smuggling of artifacts and ancient Chinese herbs, this film is an absolute classic, mainly because of Jackie Chan. Set in the Qing dynasty, this martial arts movie has won four Academy Awards, including The Best Foreign Language Film in 2000. Directed by Ang Lee, the film has Chow Yun-fat in the lead role. Showcasing the teacher-student relationship to the hilt, this film is an absolute classic. The martial arts stunts in the film are exhilarating to watch making it one of the most exciting martial arts films of all time. At No. 1 we have the greatest martial arts films of all time, The 36th Chamber of Shaolin. Every film buff would have seen this movie at least once if not more number of times. The film has Gordon Liu in the lead role of the student, San Te. Based in the backdrop of the local rebellion against the Manchu Government, this is the story of the local lad Yude coming to Shaolin to learn martial arts. Rejected by the monks for being an outsider, Yude somehow tries to win them over with his sheer dedication to the martial arts. The Shaolin Temple has 35 chambers where the novices are imparted training. The film depicts Yude aka San Te’s graduation from one chamber to another before becoming the absolute master of Kung Fu. He goes back to his home town and succeeds in defeating the tyrant before returning to Shaolin to establish the 36th chamber to enable the ordinary person to learn the nuances of Kung Fu. There are thousands of inconsequential martial arts films made all over the world. Each of these films takes inspirations from these ten all-time best martial art movies. These films play an important role in keeping the concept of martial arts alive in this world.